We began a discussion of how this project would be carried out in late summer of 2005. The conversations included biologists, librarians, and technologists, to make sure that we were covering our bases on technique, metadata, and consistency so we would only have to do this once! 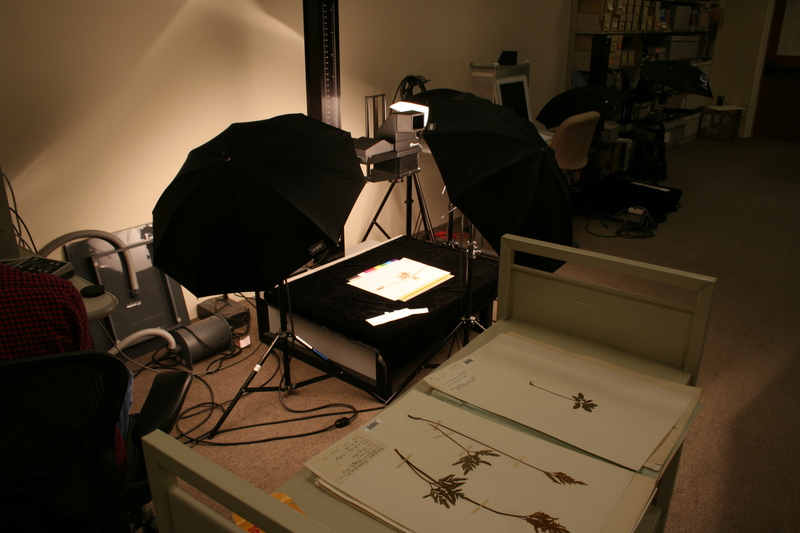 Once we had ironed out some of the metadata issues, we were able to modify our scanning workflow to accommodate the different requirements for the herbarium specimen. We agreed that we would create archival tiffs and deliverable jpegs at 300 dpi following UVa’s digitization guidelines, and our digital library workflows were already in place to programmatically extract technical metadata from the images. 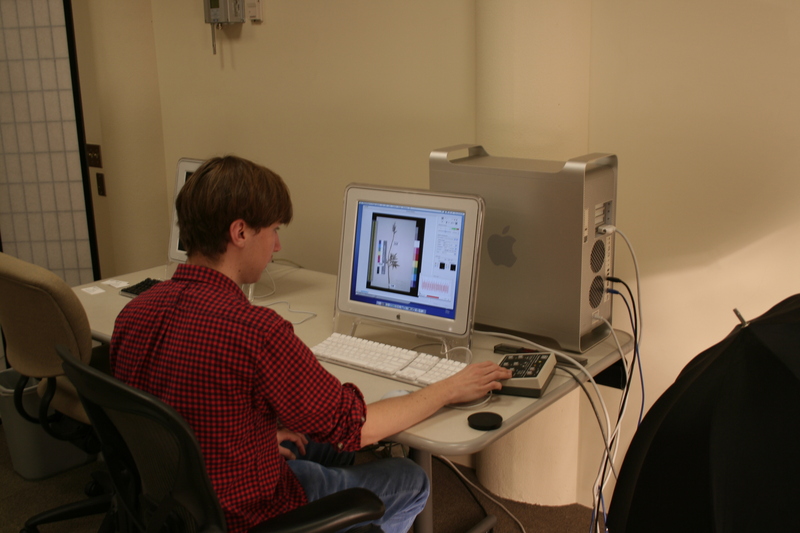 We hired a student in the spring of 2006 to begin scanning images using our overhead, Hasselblad cameras with PhaseOne P45 Plus digital scan back cameras (capturing at 39 megapixels!). These cameras are typically used for our rare print materials, including all varieties of rare books, Jefferson letters, and even copies for the Declaration of Independence. 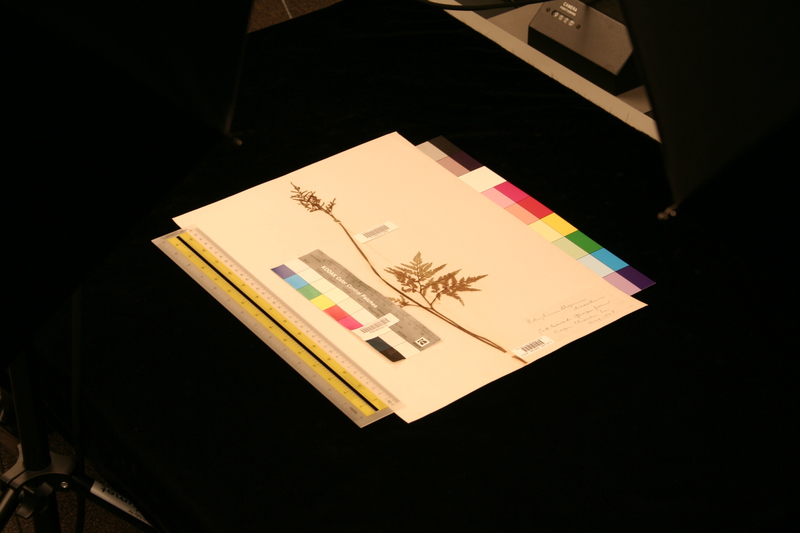 We established a set way to position the ruler and color bar so we could achieve a consistent look for the images, and this was likely influenced by other herbarium digitization projects going on at the time. It was definitely a different way to work than what we were doing for books and manuscripts. When we began this work, we didn’t really know how many specimen there were to scan, as the estimates we were provided with were in the thousands. Our workflow was to barcode the images before scanning them, create a folder name based on the folder the items were housed in, and name each image based on the barcode. Our cameras and digital backs were very slow back in 2006, and imaging took a lot longer then than it does now. Once through the basic quality assurance steps (QA) we were to send jpegs to the librarians in charge of the project so they could facilitate the metadata creation with the team they had assembled to work on this part of the project. We utilized multiple rounds of QA so at least 3 or 4 people examined each image. Scanning continued from the spring of 2006 through the spring of 2007, at which point the student working on the project graduated. Scanning resumed in the spring of 2008. Over the course of the next year, DS digitized thousands more images. This process went faster because DS had acquired new camera systems with autofocus lenses and faster digital backs for almost instantaneous capture of the images. During 2008 we continued scanning specimen as they were delivered to us. We made a big push in January of 2009 to finish the rest of the collection (over 4000 pieces), and we completed the project that month. Full-time staff involved in the project included Andrew Curley, Kristy Haney, Jeanne Pardee, and Christina Deane. John Ruscher was the primary student worker in the early part of the project, and many student employees were involved in the second phase of scanning from 2008 to early 2009. Over the course of the project, we scanned 8,935 images in all.